Various introductory matters were laid out in Part 1 of this article. If you have not yet read it, I urge you to do so before proceeding any further. Here I will offer a somewhat brief and outline-ish look at some of the nuts and bolts of what this debate is all about. At the risk of rank oversimplification, there are various ways to classify and assess the value of manuscripts. Remember, the aim of all this is to get as close to the original autographs as possible. One way is to look at the number of manuscripts. As mentioned, there are more MSS associated with the Byzantium text family. Having numerous MSS can be useful. 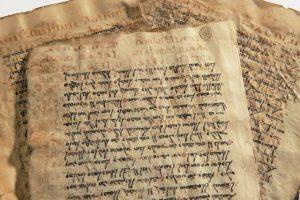 Another option is seeking to obtain and assess the earliest MSS. To see why, just think of the game of Chinese Whispers. The first few people to have an original message whispered to them will have the most accurate version. But by the time the twentieth person gets the message, the number of changes, variations and distortions of the original will likely be much greater. So earlier manuscripts are generally seen to be more reliable, as they should be much closer to the originals. Of course this is not fool proof either – more on that in a moment. A third way is to study manuscript types or families. Some of the main ones are the Western, Byzantine, and Alexandrian. Other things being equal, an earlier manuscript is likely to have suffered less from successive copyists’ slips than a later manuscript; but if a thirteenth-century manuscript has been copied direct from a fifth-century manuscript which has since been lost, it must receive almost the same consideration as its exemplar would have received had it survived. . . . The text of the Greek Testament established by B. F. Westcott and F. J. A. Hort and published with an explanatory introduction and appendices in 1881 introduced a fresh and more scientific method of classification – classification according to textual types or families. This classification has the further advantage that it includes not only Greek manuscripts but also the early versions in other languages and New Testament quotations in ancient authors. Westcott and Hort were pioneers in this matter, and their classification has been corrected and expanded, but classification by types of text has been established as the most rational and fruitful classification of the evidence. The great centres of Christianity in the early centuries tended, in the course of copying and recopying, to have distinct types of text associated with them. An eclectic approach is often taken by many scholars, where the number, the age, and the families of the manuscripts are all taken into consideration as the best and most reliable MSS are sought after. Anyone familiar with the ins and outs of all this knows how complex and detailed such discussions are. I cannot here take this further, but I strongly recommend the many excellent books featured at the end of this article for those who want to learn more about this. As already hinted at, the KJVO crowd seeks to argue that the family of Greek texts which underlie the KJV New Testament is superior to the others. So this debate is primarily about the NT only, (although some of these folks also push for the Masoretic text only for the OT), and is essentially a discussion about the reliability and accuracy of various NT manuscripts and manuscript families. Here is a very simple and brief explanation of the situation. Of the major manuscript families, two especially come to the fore here: the Byzantine textual family, and the Alexandrian textual family. It is the former that the KJVO crowd relies on, while most newer translations (since 1881) largely rely on the latter. Mention has already been made of some of those chiefly responsible for highlighting the Alexandrian text type, and other families of manuscripts. Brooke Foss Westcott (1825–1901) and Fenton John Anthony Hort (1828–1892) were Anglican textual and biblical scholars who made use of the then newly discovered manuscripts such as the codex Sinaiticus and codex Vaticanus. These and other manuscripts have become the foundation of modern Greek New Testaments: the Nestle-Aland Novum Testamentum Graece (now in its 28th edition), and the United Bible Societies’ The Greek New Testament (now in its 5th edition). Most new English translations are derived from them. As noted, this is a massive discussion which I can hardly do full justice to here. Let me just point out a few matters, and advise the reader to look more closely at the works cited in my bibliography. Some potential problems or shortcomings with the Byzantine text type include the following. The text produced by Westcott and Hort is still to this day, even with so many more manuscript discoveries, a very close reproduction of the primitive text of the New Testament. Of course, I think they gave too much weight to Codex Vaticanus alone, and this needs to be tempered. This criticism aside, the Westcott and Hort text is extremely reliable…. In many instances where I would disagree with the wording in the Nestle / UBS text in favor of a particular variant reading, I would later check with the Westcott and Hort text and realize that they had often come to the same decision…. Of course, the manuscript discoveries of the past one hundred years have changed things, but it is remarkable how often they have affirmed the decisions of Westcott and Hort. Westcott and Hort are regularly portrayed in nearly diabolical garb [by the KJVO crowd]; and Origen fares even worse, as the genesis of the non-Byzantine texts is regularly ascribed to him. The fact remains that all the text types except the Byzantine antedate Origen. That is historical fact. Westcott and Hort, especially the latter, were not quite as conservative as modern conservative evangelicals. Both made some statements I regret. Nevertheless it is difficult to find a first-rate turn-of-the-century commentary on John’s Gospel more conservative than that of Westcott. The KJV was not a direct translation of the Greek and Hebrew but simply an editorial review of various earlier English Bibles such as Tyndale’s, Wycliffe’s and the Bishops’ Bibles. And much of it was based on the inferior 1516 and 1522 editions of Erasmus’ Greek text. In their preface to the original 1611 edition the translators’ (really, editors) clearly state that this was much more of a revision of previous versions, instead of a fresh translation. There is even a clause in the title that reads, “with the former translations diligently compared and revised”. As Dr. Wallace puts it, “the King James translators knew Greek less well than they knew Latin and so they constantly relied on the Latin to get themselves through the Greek.” Also, many of its renderings are simply wrong (including important verses that discuss the divinity of Christ). But I will deal with this in more detail in a moment. And many of the earliest editions of the KJV contained numerous mistakes. Sometimes these errors were not so serious, such as translating part of Matthew 23:24 as “strain at a gnat” instead of “strain out a gnat”. But sometimes they were massive: recall the “Wicked Bible” that I listed above as one rather notorious example. Moreover, no one today speaks Elizabethan English, and while this is a beautiful and much-loved version, the aim is to communicate. Many English words used then no longer mean the same, and some now mean completely the opposite of what they did 400 years ago. Let me offer just a few obvious examples here. James 5:11 says the “Lord is very pitiful” in the KJV. Today that word means woeful or pathetic or deplorable. Back then it meant one who has pity on others. The unaware reader today would get an altogether faulty understanding of who God is and what he is like from such a passage. Or take Philemon 7, which in the KJV which speaks of “the bowels of the saints are refreshed by thee”. The Greek word translated “bowels” can mean actual inward body parts, but it can also metaphorically mean the seat of inward emotions. So instead of giving us the impression of speaking about intestines and bodily waste discharges, newer versions such as the ESV say “the hearts of the saints have been refreshed by you”. Another example is James 2:3. Sadly our word “gay” has been hijacked by activists, and so we might think of a man entering a church with “gay clothing” in quite a different light than what it first meant: fine clothing. So words do change over time, and we must take account of that. English is a living language and a changing language. A language is a “dead” language when it is no longer spoken and no longer changes, eg., Latin. To force people to live only in the linguistic past is the height of folly. And we also should talk about everyone else in the world who does not speak any type of English. Are they all doomed to being eternally lost because they do not rely solely on the KJV? -The KJV is really a retranslation of some previous English Bibles, but the Geneva Bible was much too Protestant for King James, whose sympathies were much closer to Catholicism, so he sought somewhat of a compromise version with the KJV. -It was primarily based on the work of the Catholic priest and scholar Erasmus. -It contained – at least in early versions – the apocrypha, which Protestants of course do not consider to be canonical, but is still included in Catholic Bibles today. -It did not appear till almost a century after the Reformers who certainly taught the notion of Sola Scriptura (Scripture Alone). Thus the KJVO camp would have to argue that the Reformers didn’t really have the Bible – or the correct Bible! Of course this brief discussion of Catholicism is not meant to be an argument against the KJV as such. I just offer these facts since there is so much anti-Catholicism associated with the KJV Only crowd, and these ironies at least need to be pointed out to them. “Patience” is not the best choice of word, as it gives you the impression that Job stoically took all the suffering he went through on the chin, this translation does not adequately convey Job’s experience. A helpful text note in the NIV Study Bible explains that Job was not “patient.” A patient man would not “curse the day of his birth” as Job did in chapter 3, become angry with his friends as he does in chapters 12 and 16, or express impatience as he does in chapter 21. B.F. Westcott has been much maligned over the years, but anyone who has read anything of his landmark commentaries – The Epistle to the Hebrews – The Greek Text, and The Gospel According to St John (published posthumously by one of his sons) will immediately be struck by two things: His orthodoxy of faith expressed in the depth of research and breadth of what used to be regarded as “education” – not to mention his acquaintance with ancient Mid Eastern languages in general; and his devotional comments scattered throughout. He was more than a dry exegete – he had a deep faith in the Son of God and was a defender of doctrine – doctrine derived from KJV and preserved without grounds for change in the 1881 R.V.